Tony Rauch, Eyeballs growing all over me... again. Eraserhead Press, 2010. Pp. 144. ISBN 9781936383337. $10.95. 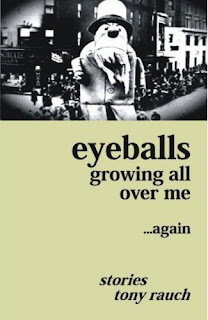 Eyeballs growing all over me... again is a collection of short stories by Tony Rauch. Some are very short: just a paragraph or two. Some are pages long and split into parts. Yet the whole book presents as a carefully staged show of playfulness, and like anything playful, could be read by any age that could deal with the concepts. There are no viscerally grisly moments here, and no bad language. A short search for Rauch himself brings up his webpage, and right there on the title page he asserts he is only full of ‘good things’. He also gives a run-down of other writings, confirming they have all been among the fantastic: ‘surreal [...] fantasy, sci-fi, dream-like pieces [...] absurdist pieces’. His other activities include architecture, art and photography. This is a graphically-minded man with an eye for detail. The press that publishes eyeballs is also not one of your run-of-the-mill presses, specialising in fantastic, weird and what appears to be a large number of zombie fictions. Aligning himself to a genre that goes by the name of ‘Bizarro’; don’t expect the mundane from this guy. I had high hopes of something perky and deliberately off-centre. When one starts to write reviews, one hopes to come the day when in all honestly one can type ‘and then a true gem comes along’. I started eyeballs on a Sunday evening. Even with two full days of work in between, I was done by Tuesday early evening. I was hooked. I may be a sucker for the fantastical, but most of the time I was laughing; and not at the antics on the page, but at the reflected antics of ‘real life’ as it was stitched up by Rauch. To begin with, we are met by a series of quotes; normally these are stirring words relevant to the text or as inspiration for the author, and three of the four are Biblical. A verse from the Book of James abjures one to be tested to have one’s mettle proven and one’s patience awoken, making one more perfect. Lines from Romans follow the theme of being tested as a means to improvement; a rather Protestant work ethic whose sternness is mitigated by the idea of just rewards and a sense of fulfilment and love. Finally a well-known quote from Matthew tells us the merciful will be shown mercy. What to make of this before a collection of outlandish and fantastical tales? Having boggled over these for a short time, I came to the conclusion that Rauch wants us to chill out, stand back, and stop trying to impose our ego on others. Indeed, his first quotation, about true personal freedom coming from removal of cultural and social hang-ups and restraints, seems more in keeping with the hectic games his stories play with reader expectations. Having finished the collection, I realised that the examples of being able to deal calmly with trials and tribulations, and the surprisingly rewards and small miracles that happen because of this that crop up throughout the collection is exactly what all this is about. It’s all about not getting swept along with a mindless mass, and it is about having your preconceptions tested, your character questioned. A good narrative should do that: it should hold a mirror up to life and make you look again. But Rauch’s book wants to do this by going out to play with you. Indeed, the reviews on the back jacket cover are all about praising Rauch’s ‘playful style’. The blank pages between sections—sections that really aren’t needed because a collection of short stories are self-contained units as it is—are pauses, moments to take a breath and consider before ploughing ahead. The choice of 1950s and 1960s sci-fi images with robots, aliens, pilots, scientists and sinister-faced men in suits are what one could expect from fantastic tales. But because they are dated, they are a little bit campy; they rubbish just a bit the very ‘serious’ fantastical themes they represent. They are a child’s eye view. These things may seem odd, but not inexplicable if one applies one’s imagination; when of course they become assimilated into the main picture and are completely natural. Rauch is a self-confessed academic (in an explanatory note that came with the e-book), alive with hyperbolic adjectival usage. He is proud, having clarified this aspect of his life, of his academic achievements, but he says he wanted to make a more actively non-academic-sounding book. And he makes good use of the simplest statement sentences and the unashamedly frank first person. This makes the narrative slide down as easily as if overhearing a conversation or watching a dramatisation; almost as if there is no effort to the reading as it reads just like colloquial English to the ear, as no one really speaks in neat sentences and well-versed paragraphs. ‘I turn my head to where she’s pointing. Sitting there on our couch watching t.v. is a great big hairy beast. He is huge—eight feet tall at least. His thick, shaggy brown hair is matted and snarled. And the stink. Worst stench ever. A crippling fog’ (‘the stench’). The old trick of using shorter sentences during exciting moments adds to the breathless pace the stories sometimes achieve. ‘“Desmond steps up to us “There a problem here?” Hinrich looks over to him, “He’s just anxious, that’s all.” I look over to Desmond, then back to Hinrich, “Hey, at least I’m tryin’ here...” (‘send krupac though the portal’). The choice not to begin a new paragraph when characters report others’ speech means that the words strike the reader on an intimate level. I had not previously considered how the formal positioning of words on the page can make such a profound difference. After all, we do not think in, or recall speech in, neatly arranged paragraphs. Those formal conventions again, arranging words place fictional action firmly beyond the fourth wall for acute observation. Running it all together, playing about with an ‘artistic’ style, monkeying with the conventions, Rauch’s writing read like nothing I have read before. It could not have been done by an amateur, or someone who had a less able grip on language. There’s no note or preface to explicate all this in the book itself. But even without the note I received, it is plain that this is someone so familiar and comfortable with all walks of language, he can play with it with impunity and see the quality of his writing suffer not at all. And that’s it, after a story that is part poetic pondering on the landscape and the sky, and part involved conversation between boy and pixie-sized farmer. I was actually physically looking for the next bit. There wasn’t any. The biggest gag in the bag is a book where outrageous juxtapositions abound. There are the religious quotations at the start, followed by the idiomatic, individualistic and carefree content of the stories. The youthful protagonists that feature in the greater number of the stories ‘speak’ with the fluency and consideration of degree level adults. The calm, considered and clever speech we wish we’d had as teens, but only learned through living life and started to acquire maybe in our late twenties (‘the new kid’, ‘I discover an army of...’, ‘little giants’ and ‘the eyes’ being the best examples). Secret, inner emotional landscapes and thoughts are laid bare to judging gaze by the virtue of reader omniscience over the first person. The characters are sharing intimately with us, the reader, and by extension, the world, and absolutely no one else. One becomes so involved with these characters, so grabbed by their voices; the irony of this is not lost. Stylistically, counter-positioning the bald, colloquial statement alongside the flowery, frilly descriptive passages and elongated diatribes occasionally indulged in by characters makes the texture of the writing quirky. A hodgepodge scrap-book of thoughts, feelings and experiences. . The usual scenario of writers on a mission is to lead the reader down the chosen path of narrative, and oh my, what have we here? A scene or a comment by a character that is actually a pictorial metaphor for a BIG LIFE LESSON the writer wants us to engage in. This can be done with varying degrees of subtly, and at its most extreme, the story becomes hijacked by pamphleteering and saddling up the author’s hobby horse. In eyeballs, the tales vary from snippets to pages long, from daft to the meaningful. But when SOMETHING is going to be SAID, instead of wooing the reader, Rauch dives right in there, and his meaningful stories really hammer it home. The highfalutin conversation of teens in ‘the eyes’ becomes a self-mockery of the ‘deep’ conversations young adults have while discovering life lessons. ‘Activate the mathias’ is a mind-boggling mass of scientific supposition and ‘send krupac through the portal’ is a quick trot through layman’s quantum inter-dimensional theory. The prose is denser, the ideas as discreet as a ten-tonne elephant on your foot, and there is no doubt that this is SOMETHING IMPORTANT being flagged. But, by such blatant flagging, the narrative deflates its own pomposity, and one begins to question the faith modern life puts in psychosocial-babble to explain everything. For many of the characters, things happen without explanation (the couple who lose their roof to a robot in ‘gigantic’, and the night-time stampede in ‘the run’). Yes, there are themes: ‘the stench’ could be read as an environmental tale, ‘the new kid’ a moral about not fearing the new and different. ‘People have been drifting away lately’ could be read as a warning about the shallow, non-committal nature of modern life and ‘the eyes’ multi-tasks: gently mocking the intellectual naivety of teenagers, while underlining the weirdness and awkwardness of transition from child to adult through the metaphor of strange and random diseases. Rauch himself hopes that we will notice his topics of “longing, discovery, secrets, escape, eeriness, surprises, and strange happenings in everyday life.” Indeed, in keeping with the childishness and innocence of the book, these could be said to be the very preoccupations for growing juvenile minds struggling to grasp an understanding of the world. But, the greatest gift Rauch’s book gives us is that, like the Fool in a King’s court (and there is a large clown puppet from a parade on the cover), he shows us very real truths and relatable experiences and problems, dressed up in foolishness to sweeten the blow. I wanted strange and wonderful things to happen to me after reading this: Rauch has helped me to believe in the power of fairy-tales, and this book, his book of weirdly cool fairy tales and parables, shakes away the ridiculous and precarious nature of ‘adult’ perception and adult expectations, and the remembrance of things playful gives us the hope mentioned in his opening quotations. The stories test and tease; but we come out the other side feeling hopeful and more light hearted. This is the sort of book I wish I’d had to discuss during literature classes at school: clever, erudite, but funny, too, and very surprising and a damn good read. I don't usually read much Bizarro or surreal specfic--I like the idea of anarchic and rule-breaking fiction, but the execution often leads to the impression that "rule-breaking" just means the author never bothered to learn English writing. Glad you enjoyed the review. I'm not sure your association of "Bizarro" with bad writing is very fair, but perhaps you've been reading bad bizarro? Either way, I hope you'll let us know if you enjoy Eyeballs.